Michael K. Bervell ’19 founded Hugs For with his older siblings when he was 11. Michael K. Bervell ’19 was a freshman at Harvard when he set out to create a board of directors for his nonprofit, Hugs for — like so many other freshman, his efforts were challenged by the chronic busyness of the Harvard student. To recruit for the project, he emailed 500 other freshmen in his class, received nearly 40 applications, and finally chose three, finalizing the makeup of the newly inaugurated Harvard-specific team. Even so, the selected board of four students never actually met in person. “After a year of working via Google Drive and chatting on the phone and the classic ‘catching a meal sometime,’ it was just a struggle and the board was disbanded,” Bervell says. The Harvard board faded in, and then quickly out of existence. 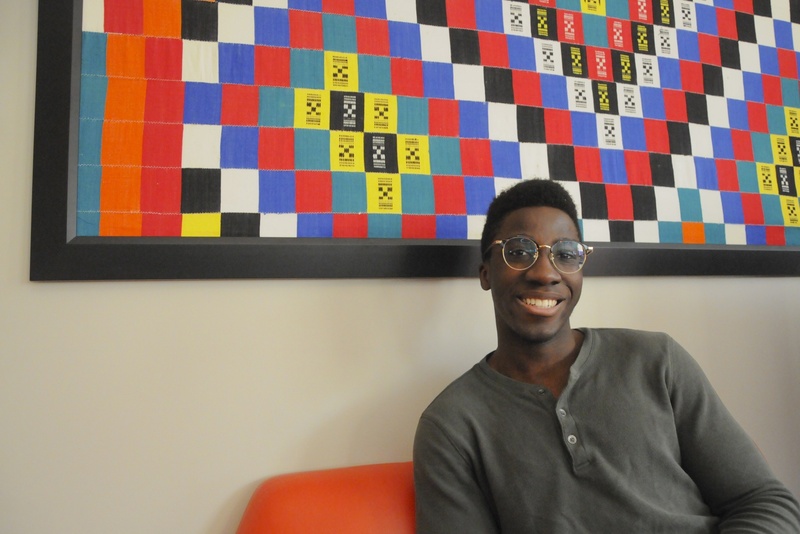 Bervell is one of several Harvard undergraduates who founded nonprofits before or during their time in college. He took leadership of his organization in high school and remained seriously involved as a full time college student. Despite the challenges that student founders face, running an organization from within the gates of Harvard Yard does come with its benefits. After the 2016 election, Jahnavi S. Rao ‘22 founded New Voters, a 501(c)(3) organization that encourages newly eligible high schoolers to register to vote. In addition to running her nonprofit, she is involved with four performance groups on campus and the Institute of Politics. Yet, the many difficulties of organizational leadership, especially at such an early stage in life, reliably present themselves. College-aged nonprofit founders face hurdles beyond time management — with less than 22 years of life experience, they grapple with the challenges of defining a philanthropic mission, navigating thorny legal procedures, and organizing projects and employees. There are currently more than 1.5 million nonprofit organizations registered in the United States, and nearly 80,000 new nonprofits are created every year. About 60 percent operate with a budget under $250,000. Small-scale nonprofits are everywhere, and with the increasing accessibility of technological resources, young people are finding it easier than ever to create their own tax-exempt, federally-recognized organizations. As an institution that seeks out socially-engaged innovators, Harvard attracts more than its fair share of these young philanthropists. Trisha N. Prabhu ‘’’22 created and patented ReThink, an anti-cyberbullying app that detects harmful language and nudges its users to ‘rethink’ the words they are about to send or post. Prabhu is now the CEO of the social venture ReThink, Inc. Though the company is not a nonprofit, she and her team are working on creating ReThink for Good, a nonprofit branch that will focus on providing ReThink-equipped devices for underprivileged high schools. Prabhu’s app is far from the first anti-cyberbullying initiative — organizations like The Cybersmile Foundation and STOMP Out Bullying share similar missions. But Prabhu claims that ReThink adopts a preventative approach to cyberbullying, in contrast to other organizations focused on alerting authorities or parents and spreading awareness. “As important as these issues are, the fact is that 90 percent of teens don’t tell anyone that they’re being cyberbullied. It’s really hard to tackle the issue if we’re putting the burden on the victim instead of attacking it where it really starts, which is with the cyberbully and with individuals who aren’t making responsible decisions online,” she says. ReThink has been downloaded over 500,000 times, in part due to Prabhu’s appearance on ABC’s “Shark Tank.” She joined the less than one percent of applicants who make it onto the business-focused reality TV show. 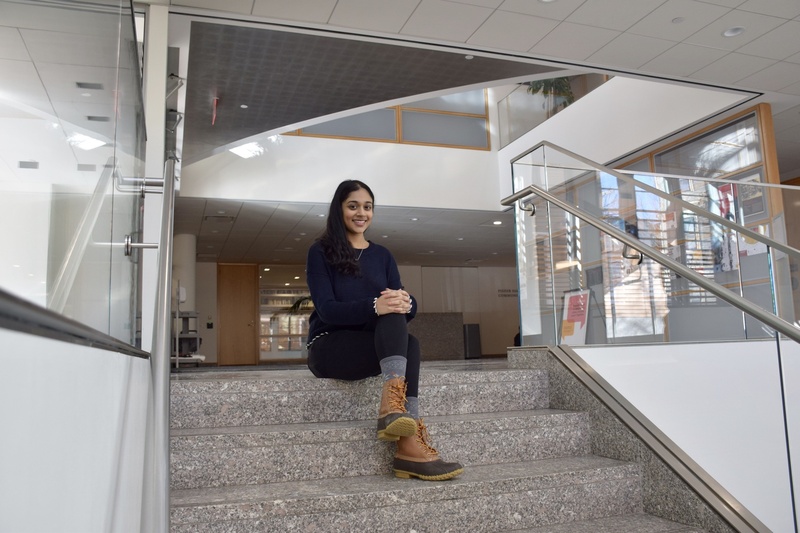 Trisha N. Prabhu '22 created and patented ReThink, an anti-cyberbullying app that detects harmful language and nudges its users to ‘rethink’ the words they are about to send or post. The ReThink app has a 3.2 star average rating on the U.S. App Store. While many reviewers are delighted by the app’s mission, others critique its slow performance and lack of autocorrect. One reviewer even urges her to drop the patent so that similar technology can be developed with more functionality, and therefore, a greater social impact. When asked about the possibility of dropping her patent, Prabhu remains steadfast in her reasoning. She was a 2014 Google Science Fair Global Finalist and was first advised to patent her app when she presented it to a panel of Google researchers, who encouraged her to claim her intellectual property before a larger company took the idea. She explains that many larger companies are hesitant to even admit the extent to which cyberbullying manifests on their platforms, and she worries that her technology will stagnate if it is picked up by another company. “Maybe we don’t have the most flawless technology, but it’s something that we’re always working on and we always care about the issue.” The iOS app was last updated over a year ago. She says her real-life experiences with cyberbullying make her more qualified to tackle the problem than members of an older generation who might want to implement her solution without a strong personal knowledge of the problem. “It was an issue that I had experienced a lot because I grew up in a town that was predominately white and I was one of a few women of color, and endured a lot of racial slurs and lots of language against my family and my origins, especially when I was younger,” Prabhu recalls. The understanding that personal experience can offer young nonprofit founders does come at the trade-off of significantly less work experience in the nonprofit sector than their older counterparts. Siri, What Is a Nonprofit? The legal legwork of establishing a nonprofit is complicated. In most cases, in order for donations to an organization to be considered charitable, it must be a 501(c)(3) organization, and the process of filing for this status was different for every founder we spoke to. Alexandra E. Summa ‘20, founder of Iconic NYC, had her father fill out the paperwork for her. Kopparapu filled out the paperwork herself, but her parents co-signed it because she wasn’t a legal adult at the time of filing. Nadya T. Okamoto ’20-’21 and her co-founder, Cornell student Vincent Forand, were completely in the dark before they started the filing process for their organization PERIOD. “I didn’t even know what a nonprofit was when I started. I just knew that it was a keyword for doing something good,” Okamoto tells us over the phone. “When we started, we were Googling questions like, ‘What is a nonprofit?’ ‘What is the IRS?’ ‘What is a board of directors?’ I had no idea what this would turn into at all.” PERIOD now has over 300 chapters spread across several countries. Okamoto recently decided to take a year off from Harvard to work for PERIOD full-time. “After sophomore year, I was just really ready for a break,” she explains. In preparation for her return to school, she has hired a managing director and other staff to take over some of the administrative roles she has filled in the past. Even though they may not have had extensive knowledge or experience to begin with, many founders have been able to learn on the fly and grow their organization in the process. Okamoto has recently published her first book, titled “Period Power: A Manifesto for the Menstrual Movement”, which she hopes will further her mission of reducing the stigma surrounding menstruation globally. Despite a lack of targeted advertising, more than 300 participants signed up in two days for Girls Computing League's first summit on artificial Intelligence. 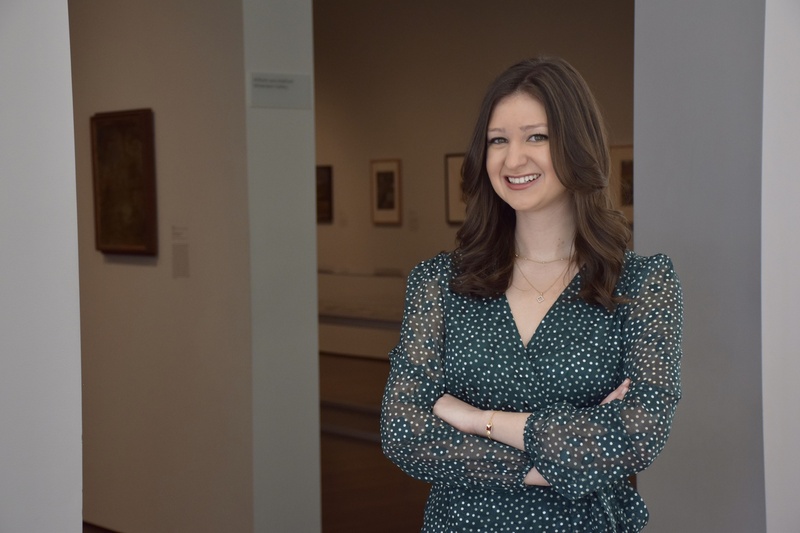 Alexandra E. Summa '20 is the founder of Iconic NYC, an organization dedicated to preserving New York City’s traditions and landmarks. The ‘horse carriage crisis’ – alternatively referred to as the “carriage wars” on Iconic NYC’s website – refers to controversy surrounding proposed legislation by Mayor Bill de Blasio and animal rights activists to get rid of Central Park’s horse drawn carriages. Summa saw the attack on the horse carriages as an attack on New York City’s image, and was determined to help keep the carriages in operation. She has faced criticism for her work, primarily from animal rights groups. “On one hand you get people who think it’s really awesome that you have a nonprofit that you’ve had since you were 15 years old, but then there’s also the other side that doesn’t really agree with what I’ve done with it,” she says. Once Mayor de Blasio dropped the legislation to ban the carriages, Iconic NYC shifted its focus to preserving other New York City traditions. Because it is a highly localized nonprofit, Summa has taken a step back from her work while living in Cambridge. She’s not sure who is currently on the board due to recent organizational reshuffling. Harvard’s nonprofit founders seek to collaborate with already-established giants in their respective fields and fill holes that they believe other nonprofits have overlooked. New Voters’ function is similar to organizations like TurboVote and Inspire U.S., though New Voters focuses exclusively on high schoolers. Girls Computing League began with a similar mission to Girls Who Code, though Kopparapu is shifting the focus towards “very specific, cutting edge parts of computer science and their applications, rather than a general ‘learn how to code’ workshop format,” she says. With approximately one registered nonprofit for every 217 people in the United States, some mission overlap is inevitable. Garrett W. Walker ‘21, the incoming president of Harvard College Effective Altruism, notes that there’s a danger in spreading donations between groups with a similar goal but varying levels of demonstrated efficiency. So when young people begin nonprofits, they can inadvertently contribute to “scattering the resources more thinly” between organizations, he observes. Most new nonprofits will successfully produce some amount of net good, though efficiency must be considered –– especially in a world where needs are numerous and resources are scarce. The effective altruism movement uses verifiable data to evaluate the relative utility of organizations in order to determine which are most worthy of donations. “I think the one sentence definition would be, “Doing good better,’” Walker says. Determining how to “do good better” involves deeply considering an organization’s credentials and track record — particularly the degree of impact it makes relative to its budget. These types of questions require large amounts of quantitative data that many student organizations simply can’t provide. He adds that working at an already-established nonprofit can lead to being prepared to start a new nonprofit in the future. And, of course, the two are not mutually exclusive — the new nonprofit will likely be more successful if its founder has the on-the-ground experience. “My sense is sometimes the nonprofit comes before the learning and the actual deep involvement with the issue,” Dromi remarks. Many of Harvard’s nonprofit founders receive extensive national media coverage and public praise for the good that they appear to create. Yet, at the same time, those we spoke to seem to have some self-awareness about the instability of running a nonprofit as a student. During our interview, Bervell brings up Okamoto and PERIOD as an example of a student-run nonprofit that has prospered despite the pressures of undergraduate life — though Okamoto is currently taking time off from Harvard. —Magazine writer Anna Kate E. Cannon can be reached at anna.cannon@thecrimson.com Follow her on Twitter @ae_cannon.